Clicking on a thumbnail will take you to a page for that signal. Americans love innovations and traffic signals were no exception. America is a country on the move and from the early beginnings of the 20th Century inventors were producing ingenious traffic control devices. 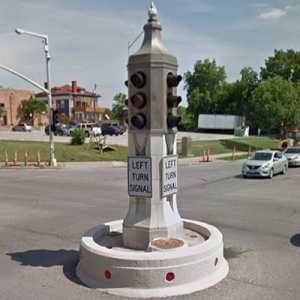 In the post war boom, nearly every town had to have at least one traffic light whether traffic flows necessitated it or not. 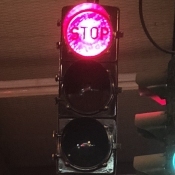 Growing up in the 1950s, before strict regulation and standardization of traffic signal devices, I was able to view a number of interesting signals no longer found above city streets. 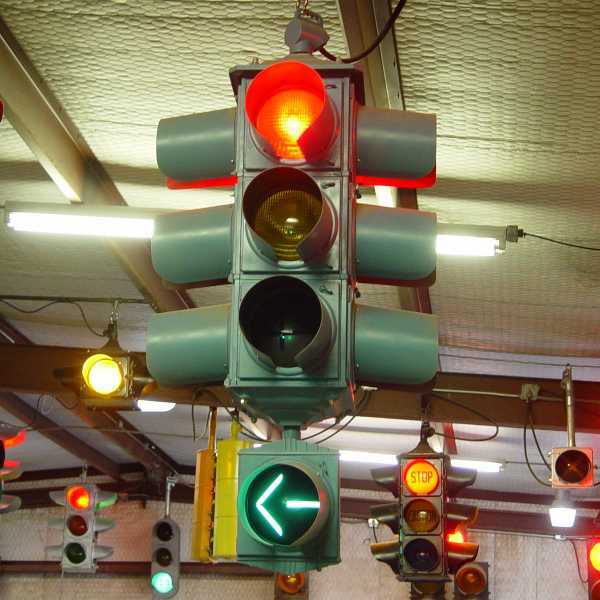 Since retiring I have started to collect and restore old traffic signals... some rare and some not so rare. This web feature chronicles this adventure. This site is constantly being revised as signals are restored. As I develop this site, I am indexing it by signal manufacturers represented in the collection. In the close-up pages for each manufacturer I'll present the known history of the manufacturers and show the models represented from that manufacturer in the collection. This index will start with the major signal manufacturers in alphabetical order, followed by the more minor manufacturers. 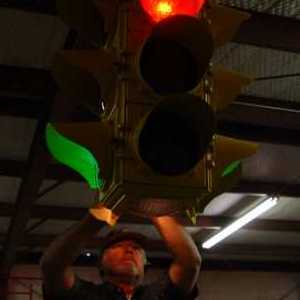 Crouse-Hinds was one of the original traffic signal pioneers. 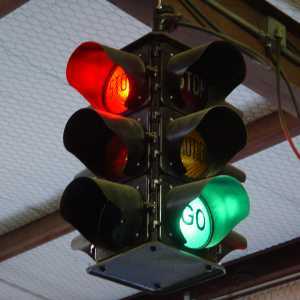 Their distinctive art deco signals that appeared from the 30s until 1959 were legendary and quite sought after by collectors. The collection presently includes an early cast iron single face beacon, a Type D beacon with down light, a DT 4-way beacon, two DT 4-ways, two DT art deco single face heads, a Type M 4-way beacon, a Type M 2-section 4-way, a Type M 3-section 4-way, a Type M single face head, and a Type R single face head. 1953 DT from New Orleans. 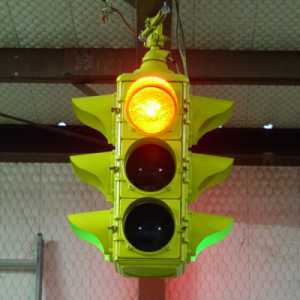 Eagle Signal was another significant traffic signal manufacturer. 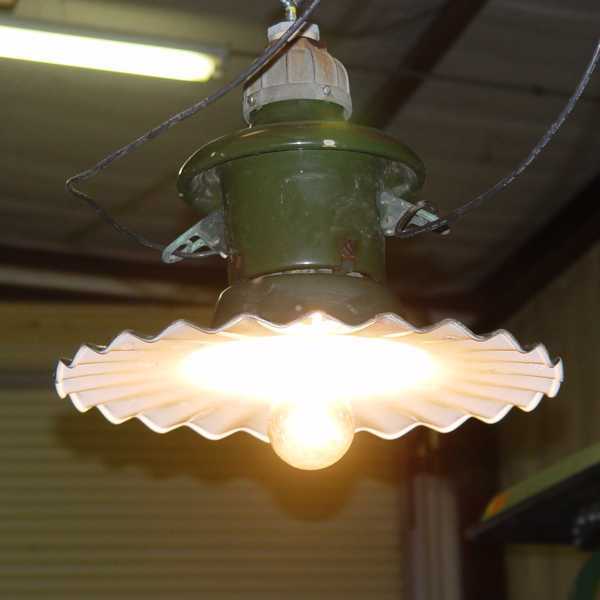 The early Eaglelux and subsequent Eagle signals were distinctive and classics in the post WW-II era. Eagle was eventually acquired by the Mark IV Corporation in the 1980s. As LFE Automatic Signal was also absorbed by Mark IV, an LFE head is included in this section. 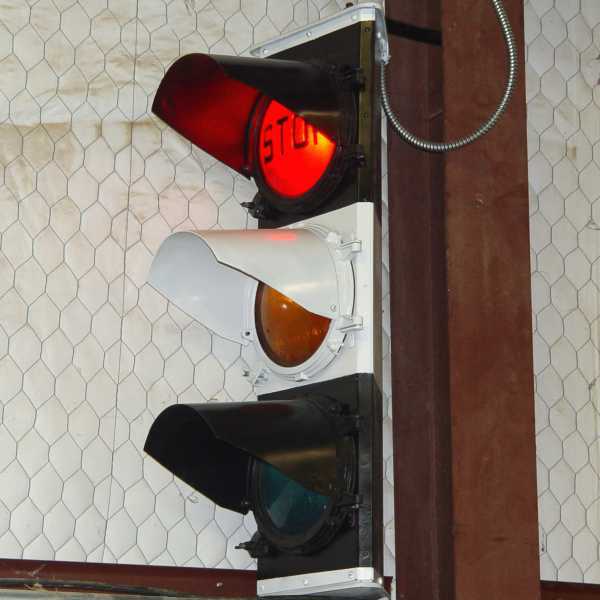 The collection presently includes an Eaglelux 2-color 4-way, Eaglelux "pagoda" 4-way, an Eaglelux 4-way beacon, an Eaglelux single face head, a rodded Eagle flatback single face head, an Eagle flat back pedestrian signal and more modern 12-8-8 single face Eagle and successor signals such as Alusig and Durasig. An Eaglelux Pagoda from Ft. Worth, TX. GE was another powerhouse signal manufacturer that produced durable 4-way and single faced signals. In 1954 GE produced a futuristic "Streamline" model made of stamped rather than cast aluminum that was just starting to gain a market share when GE was purchased by Econolite. 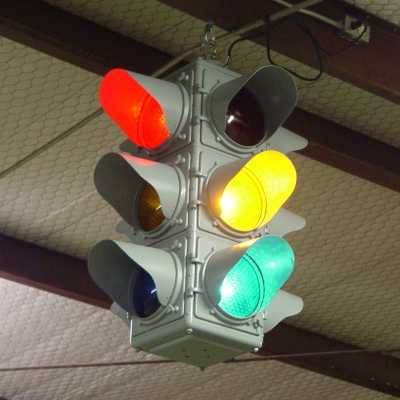 The collection presently includes a GE 4-way, a solid body single face head, a "groove back" single face head, a Streamline traffic signal head and a Streamline pedestrian signal. GE 4-way from Pittsburgh, PA.
Marbelite was an interesting manufacturer that acquired the product lines of the distinctive Horni Manufacturing of early New York City signal fame and Signal Service Corporation (SSC,) the successor to the incredible looking American Gas Accumulator (AGA) signals. Early Marbelites were easily distinguished by use of their "tunnaway" visors that were crosses between traditional cap or cutaway visors and tunnel visors. The collection presently includes an early Marbelite "flat top" single face, a contemporary Marbelite single face, a fixed 4-way, a 5-light Marbelite "dog house" signal and a New York City "DONT WALK / WALK" pedestrian signal. Seattle Marbelite 4-way with lighted sign box. 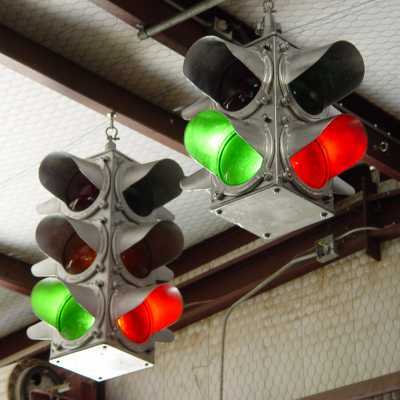 Southern Switch & Signal Co. of Shreveport, LA, produced a number of brands of traffic signals. Many of these manufacturers offered low cost 4-way signals from the 1930s up into the 1960s that were ideal for small towns. Many signals had internal timing controls that weren't very sophisticated but were ideal for smaller, "stand alone" intersections. 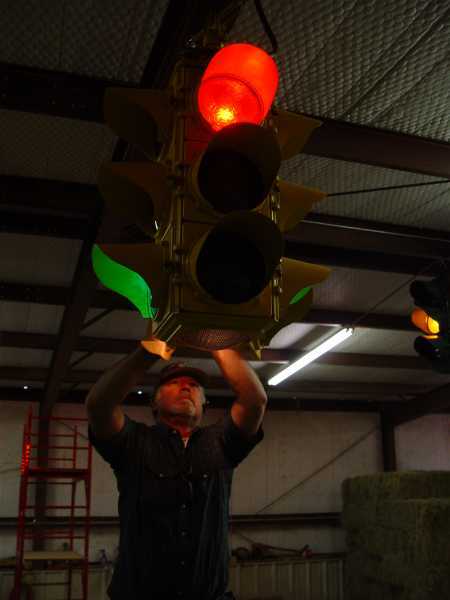 One company, Teeco Safety, until recently still sold 4-way signals internally controlled or separately controlled, for use in replacing classic signals in historic districts. 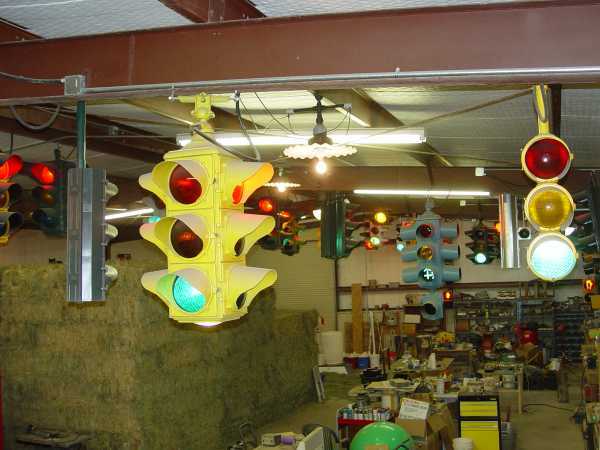 The collection presently includes Southern Autoflow and Sargent-Sowell internally controlled 4-way signals, a Sargent-Sowell beacon and a Traffic Signals Inc. (TSI) externally controlled 4-way signal. W.S. Darley & Co. of Melrose Park, IL. produced simple but durable low cost signals popular in thousands of small towns across America. A handful are still in service today. Darley signals are pretty hard to come by but the collection includes one model C-810 2-bulb 4-way, a C-811 3-bulb 4-way, a D-131 4-way beacon, an E-326 8-bulb 4-way, a D-200 12-bulb 4-way and a D-480 single faced signal. A couple of older Darleys. The collection includes a number of other brands of signals that are listed separately. Some of these were independent product lines that disappeared and others are brands that either evolved from earlier signal lines or were absorbed by larger companies. 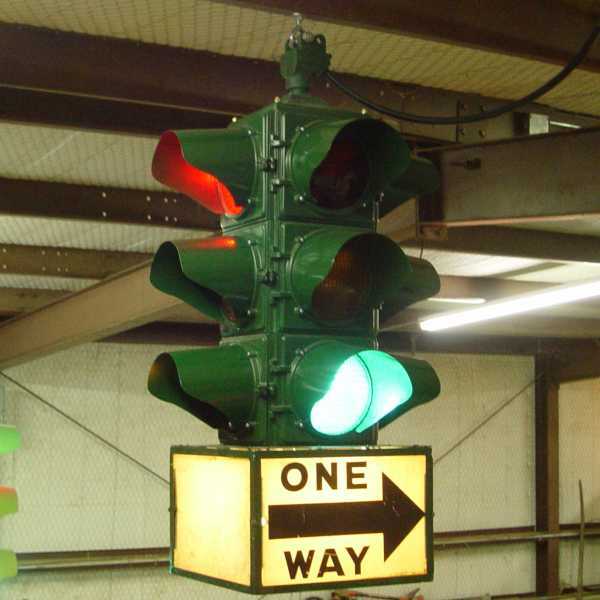 There were some clever ideas that inventors came up with over the years, most of which fell by the wayside as traffic control devices became more standardized. 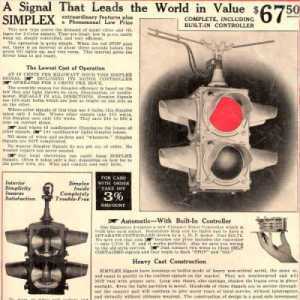 The Trade Ads and Catalogs section includes ads and catalog pages from familiar manufacturers such as Eagle and Crouse-Hinds as well as many unusual manufacturers of traffic signals, signs and traffic control devices dating back to the 1920s. Darley C810 Simplex Signal, circa 1940s. 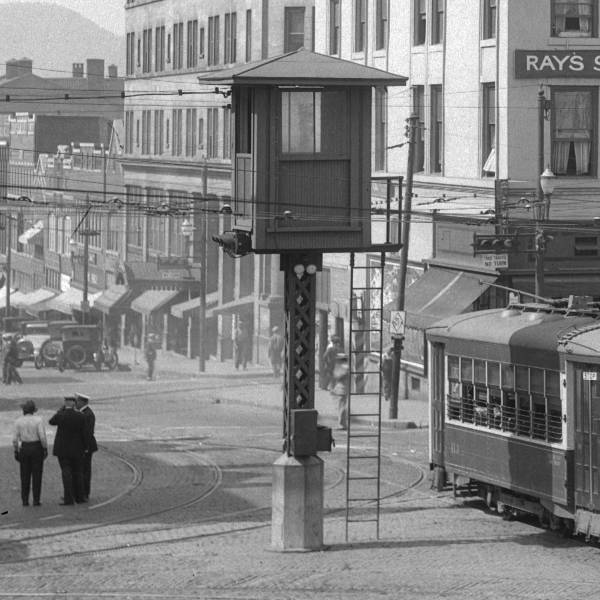 The History section describes the evolution of traffic control from early mechanical devices to modern electric traffic signals. This section is continuously being updated. Asheville, NC traffic tower and signals. The "survivor" section is a pictorial that shows some of the many fixed 4-way signals that still exist and are in service out in the real world. 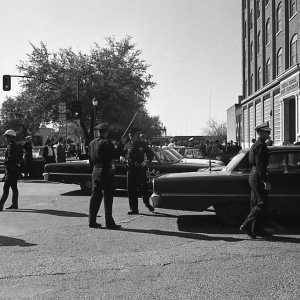 "JFK: The Lost Bullet" is a fresh investigation into the John F. Kennedy assassination. Here is how the collection was involved. The Street Lights section shows some of the street lights that have been restored and included in the traffic signal collection.